I have joined the Shintaro Akatsu School of Design (SASD) at the University of Bridgeport as the Chairman of the MPS program in Design Management. Besides encouraging insightful work from an international group of smart, talented, highly-motivated graduate students, I get to enjoy this beautiful view from the seventh floor of a magnificent facility directly on Long Island Sound. I was invited to return to teach for a second time in the graphic design program at Ludong University in Yantai, Shandong Province, China this past May (scroll down for a description of my first visit). Instead of three classes in two weeks, I was able to work a bit more in depth by teaching two courses in three weeks. It was a sheer delight to reconvene with the faculty and school leadership, who have become good friends. Though I have been told southern China has a much more varied and challenging menu, I had my first “sea rabbit” (on Chang Dao, or “Long Island” above). Back on the mainland I had pig’s head and, completely by coincidence, my first duck’s head later that same day. That was The Day of The Head. I was struck by how removed we Americans tend to be from the source of our protein: it is cut into pieces that are presented on foam plastic trays under plastic wrap in beautifully-lit supermarkets. That it ever came from any living creature is thoroughly disguised. It is a quite different eating experience when the creature’s eye is staring at you in situ. But there is nothing to be done but dig in – and both times I went for the cheek meat, which is approximately as far away from any namable face part as possible. The pig’s head was delicious. But you may be assured that eating duck’s head properly is a much more active process than merely picking at its comparatively-tiny cheek. We’ll leave it at that. I was sent this by a friend, but the source is Cool Infographics, a valuable site. Colin Harman designed it, and it is a delight. Pass it on to friends and family, those who are most likely to remind you of this most frustrating triad. 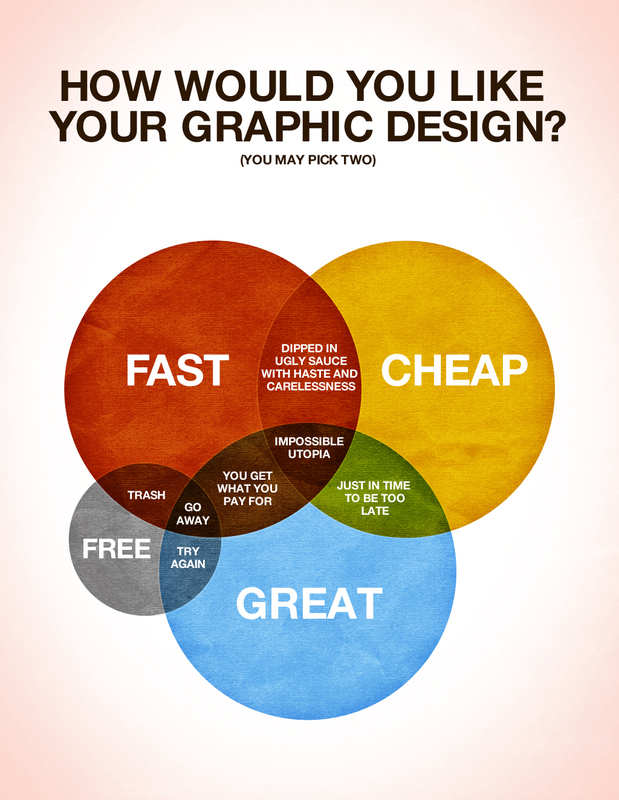 This is a Venn diagram by Rich Stevens 3, a former student of mine. And this is a basic Venn diagram showing the intersection of two sets. I spent the last two weeks of December 2011 completing a two-week teaching gig at Ludong University in Yantai, Shandong Province, China. I was asked to teach graphic design there by the Shintaro Akatsu School of Design at the University of Bridgeport, with whom Ludong has developed an international affiliation. I followed an opening two-week visit by a colleague from SASD, Professor Emily Larned. As far as the leadership at Ludong University is aware, this is the first time graphic design has been taught in China by visiting Western professors. Yantai is a city of 8 million people about an hour and ten minute’s flight east-southeast from Beijing. It is a port city on the Yellow Sea, so seafood is plentiful – and wonderfully different. In addition to being a regional business center, Yantai is also renowned for its extensive apple and cherry harvest. This is a composite shot of a principle intersection in downtown Yantai: the buildings there are not actually tilted – at least not to this extreme. These photos were taken on a too-long run from campus: I was pressed for time an hour and ten into the run when I finally found my destination, the harbor. Asking passersby for a more direct route back to the university, I was told “too far” by the first two. I eventually got directions and made it back to campus in 35 additional all-uphill minutes. That was a no-rest-for-the-weary push. Ludong University is a medium-sized Chinese institution of about 25,000 students, half of whom are studying at the graduate level. They draw their students from all over China, though the majority come from Shandong Province, which is a large area – taking about seven hours to drive across from end to end. Paper in China is not particularly expensive, but it is respected as a finite resource. Instead of taking notes, students photograph everything with their phones, including their professor who is holding up a study for discussion. Chinese students do not own their own printers, so outputting studies at the local print shop, which is closed from 7pm until 8am, is part of their homework planning. The two-week course could not have been nearly as successful without the extraordinary skill of Xu Shanshan (or “Sophie,” in the foreground), my graduate-student interpreter and translator. I was talking for two weeks about letterform abstraction, image abstraction, and conceptual abstraction, none of which are especially easy to grasp in English (I know this: I teach it regularly), and Sophie not only translated what I said, she understood and was wonderfully able to express what I meant. This was made evident in the students’ work. Here are most of the students with whom I worked at Ludong with Sophie, who is holding an inscribed copy of my Advertising Design and Typography book. It was important to me that she be presented with this in the presence of “our” students. It was cold, snowing every couple of days, and heat is extremely carefully used. Coats are worn by everyone all the time, outdoors and in. Twice-per-week celebratory dinners with professors, deans, and key administrators were occasions to eat until failure: a brilliant ritual! There were several opportunities to visit extraordinary cultural sites. This huge Taoist temple is near the town of Guzhen, Qixia City, very near the Mu Family Man­or, the largest (480 rooms) intact feudal landlord manor in northern China and a protected historical site which was begun in 1723. Please join me. The lecture is $20 for Graphic Artists Guild members and $30 for others*. That is a saving of at least $400 over what you would pay for two hours of any other kind of talk therapy in Manhattan, which I am lead to believe is over $225 per hour. By very special arrangement, my students get in free: thank you Graphic Artists Guild! Lots of Q&A. If you bring an already-purchased book**, I will be delighted to sign it. If you bring a book by another author, I will do my best to disguise my handwriting as I sign it with their name. (My cousin Miguelito introduced me to this idea when he spent an afternoon signing all my LP sleeves in 1972. Each signature was distinctly different. Looking back, I wish I’d kept my fake signed Carlos Santana vinyl. *If you visited this site earlier, I was mistaken about it being free for everyone. I apologize for not having the facts and for making hasty assumptions. That’s what gets me into trouble as a designer, too. I hope you will consider joining us on Thursday anyway. I will do my level best to help you see differently in those two hours. It won’t be one of those presentations that goes on and on about how wonderful the speaker is and how wonderful their clients are and how wonderful it is to be them. No. My goal is to give you a two hour dose of another way of seeing. Using words. Cool if it works. Come see if it works. I am delighted to have been named design director of the Westport Cinema Initiative here in Westport, CT. Under the leadership of Sandra Lefkowitz, our mission is to build two small movie theaters in downtown Westport, in which first-run foreign films and film festivals and accomplished amateur efforts can be seen and discussed. The WCI theaters will be places where the love of cinema is celebrated. Westport has lacked any movie facilities since 1999, when the Fine Arts theaters gave up under perpetually-increasing rental costs. With the exception of a couple of notable restaurants, downtown has suffered from the loss of purpose after sunset. Our intention is to bring a focal point back to town – and to further the already outstanding arts community served by the Westport Arts Center and the Westport Country Playhouse. I am particularly proud to be working with four fine Westport-based designers: Gene Seidman, Jerry Kuyper (who designed the logo), Moshe Aelyon, and Sooo-z Mastropietro. My pal Fred Showker at graphic-design.com sent me ten questions about design and space in readying his book review of my Elements of Graphic Design, 2nd Edition. Please visit his site for the book review. Fred and I met as co-hosts of a design seminar series for the Department of Defense in D.C. Crew cuts and uniforms on many… but definitely not on us. Fred’s questions are below, my responses are here. What is white space and why is it important? What are the three raw materials of graphic design and visual communication? What is the difference between “nothing wrong” and “something right” with a design? Let’s talk about history: when was white space invented? Let’s talk about art: what is white space equivalent to in other arts? Let’s talk about law: is it really a crime to misuse white space? Let’s talk about food: it is said white space makes a design “tasty.” True? What is “hidden” white space? What is wrong with filling in all the space? If white space is so important, why aren’t there any empty pages in your book?